Marine wind generators are a great way to recharge your batteries. Once you've bought one, they will make free energy for you! Not a bad deal, don't you think? But, before you buy one, you need to know all the facts to make an informed decision. As we all know, we need to keep our marine batteries in a charged condition. If we forget about them and go too low in voltage, we can ruin them! So, we need to look at the best way(s) to prevent this from happening. Wind turbines make a great solution! There will be always wind. Whether you are moving, at anchor or in the marina, whether it's day or night, as long as there is some kind of breeze, the wind turbine will produce energy. It's environment-friendly, there's no polution. There's a wind turbine set on the market whatever your needs. 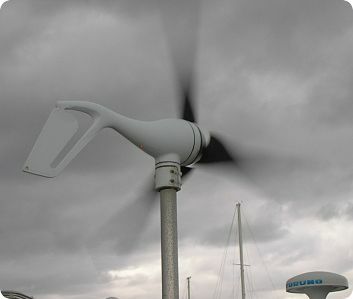 Marine wind generators catch the kinetic energy from the wind through the aerodynamic blades. This makes the blades turn around. Now, the kinetic energy is converted into mechanical energy. Because the blades are all connected to a shaft that turns around with the blades, a generator will use that turning shaft to produce the electricity to recharge our 12V or 24V batteries. Easy and effective! To get a decent current out of our wind turbines, we need steady wind speeds of 10 knots and higher. The higher the wind speed and the bigger our blade swept area (= blade-diameter), the more energy will be produced. In more scientific language: the power produced is proportional to the square of the blade diameter and the cube of the wind speed. Now, the real problem with marine wind generators is when we have very strong wind speeds. The energy generated can be so much that the wind turbine can damage itself. So we need to protect the generator and our batteries. The solution for that is a regulator or charge controller. This is a piece of equipment that senses the voltage of the battery and decides which action should be taken. The goal is to prevent overcharging, which can be dangerous when batteries begin to cook and disperse the explosive hydrogen. In case of a 12 Volt battery system, when your battery voltage reaches around 14 V, the regulator will take action. The wind generator can be stopped or slowed down, so that the generated current stops or diminishes. This method we see with many smaller and medium output models. The wind generator has an internal mechanism that changes the pitch of the blades. So each blade turns on its own axis, in order to catch more or less wind. This system works using the centrifugal force. The faster the wind speed, the more the blades will be turned so that they catch less wind. 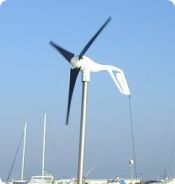 Similar to this system is the one that uses flexible blades that can bend easily if the wind gets too strong. The downside of this last one is the increased noise and vibration. Most large output sets will have dump loads in the form of large resistors that take the excess energy. The energy will dissipate as heat. Having said that, it's always wise to secure the blades when you're expecting winds of more than 50 knots and in storm conditions. Most wind generators come without regulator, some have it built in. Whatever the case, you do need one. To have an accurate working regulator, place it as close as possible to your batteries. This way you avoid a misreading because of the voltage drop caused by long cables. Also protect your electrical system with fuses and use the right size cables and large terminals to carry the current. Go to Marine Wind Generators part II!